Who hasn’t heard of Vincent Van Gogh? This prominent artist has become an icon, and not only in his Dutch homeland. The largest museum in the world completely dedicated to his work can be found in Amsterdam. As you might already have read in my blog, I am a complete museum nut. And the Van Gogh Museum in Amsterdam is high up on my list of favorites. This isn’t only because of his impressive creations, but also due to the many different exhibitions of other artist’s work this museum hosts. In the Van Gogh Museum, there is always something new to see. Tickets can be purchased online here. You will find the Van Gogh Museum in Amsterdam’s Museumplein. This stunning location is surrounded by other world-renowned museums which similarly house works by great masters. Unlike many of these buildings, the Van Gogh Museum premises are modern, incorporating huge panels of glass which allow light to stream in and create some stunning effects. Even though this particular museum has become extremely popular in these past years, the location is light and spacious and offers a generous collection for everyone to enjoy. You will not only find Vincent Van Gogh’s famous self-portraits and landscapes here, but you are also given the opportunity to learn about his life. Paintings by other artists who inspired him, letters he wrote to family and friends, and his diverse projects and drawings created throughout his life are on display. You will also see work by artists inspired by Vincent Van Gogh long after his death. We have visited Amsterdam a few times, but had never been to the Van Gogh Museum. Now we have, and it was amazing! Really worth taking the time to see his work up close; such brushmanship. Make sure you book your tickets early to avoid having to wait in line! 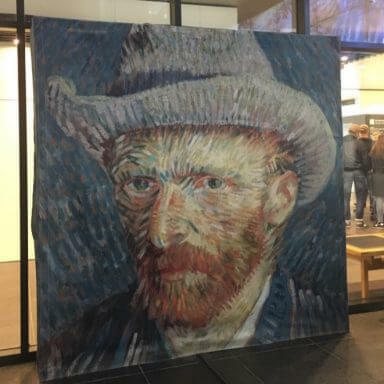 In addition to its already vast collection, the Van Gogh Museum also hosts impressive temporary exhibitions from similar artists which are definitely worth a visit! 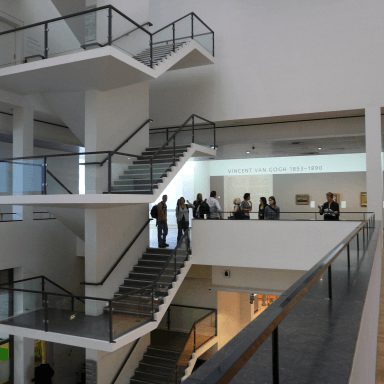 Past exhibitions have included collections by Gauguin and Malevich. The museum also organizes fun workshops for young and old. Places need to be reserved and are not free, but I would definitely recommend your joining in. Examples of workshops include lithography and wood carving, which are not only fun to do, but also give you a completely fresh way of looking at Vincent Van Gogh’s work. The museum shop is located on the third floor and stocks many books about Vincent Van Gogh’s masterpieces and life. 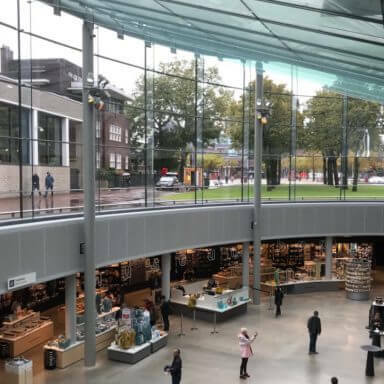 You will also find a shop on the Museumplein which offers a wide range of gift ideas and souvenirs from both the Rijksmuseum and the Van Gogh museum! Visitors often have to stand in line for 30 minutes or more, so I recommend your purchasing tickets beforehand. You are required to fill in the date and time of your visit when booking online and have a window of only 30 minutes, so keeping to a strict schedule is important. With your ticket, you can bypass the long queues and step straight inside. You can buy your ticket here. A multimedia tour of the museum is a great way of getting to know about Van Gogh and his work. This paid tour can also be reserved online along with your tickets. Children under 13 can participate for free. As I have already mentioned, this museum has become an incredibly popular meaning that long queues and waiting times can sometimes cause exasperation. You should always reserve a ticket before your visit, and try to avoid Fridays, Saturdays or Sundays if at all possible. The museum is open every day between 9 a.m. and 6 p.m. On Fridays it stays open to 10 p.m.
On Fridays, the Van Gogh Museum remains open until 10 p.m., with a free tour beginning at 7 p.m. The atmosphere within the museum is very different, music is played and VJs create stunning visual effects. You will find the Van Gogh Museum at the Museumplein 6 in central Amsterdam. As it is located in a particularly busy area, you should consider using the public transport system. Trams 2 and 5 leave from Centraal Station and drop you off at the museum entrance. If you prefer to arrive by car, use the Q-park under the square. I should warn you that parking here is not cheap! As someone who loves Van Gogh, I definitely need to take a look at this! 649 visitors rated Van Gogh Museum average 4.65 stars out of 5.